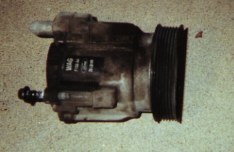 This smog pump removal was performed on a 5.0L 1995 Mustang GT. This is a fairly easy modification and should only take an afternoon to complete. Removal of your smog pump is not recommended for cars with catalytic converters still installed. 1) Install your stock belt (or similar) which still runs your smog pump. This belt will aid in removing the four bolts which hold the plastic pulley to the pump. You need to remove this pulley to remove one of the two bolts holding the smog pump to its bracket. 2) Using a 1/4" drive or small wrench, loosen the four small bolts which hold the pulley on the smog pump. DO NOT REMOVE THEM YET! 3) Remove the belt from the engine. 4) Remove the four bolts from the pulley. Remove the pulley. 5) Disconnect the rubber hose from the smog pump by untightening the hose clamp at the pump and pulling the hose off. 6) Find the two long bolts which mount the smog pump to the bracket. Remove these and set them aside with the pump. 7) Disconnect the two vacuum lines which connect to the rubber hoses leading alongside the passenger's side header. Plug with snug fitting 1/2" bolts and use a cable tie around the connection to secure the bolt inside the vacuum line to prevent a leak. 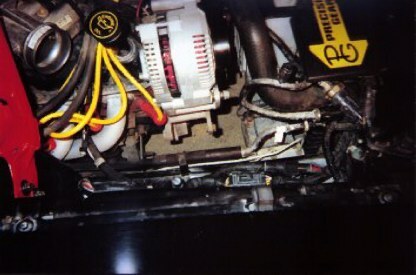 8) Remove the hose assembly by disconnecting at the two steel pipes close to the firewall. One will lead to the back of the cylinder heads, the other runs underneath the car to the connection on your H-pipe. * You now have the choice to cap off these two steel lines, remove one and cap off the other, or to remove both lines. If you are not removing your heads at this time and will be in the near future I would recommend leaving that pipe installed to the back of the heads and cap it. This pipe cannot be removed without cutting it or removing the heads. The steel line leading to the H-pipe cannot be removed either unless you cut it. If you decide to remove the line from your heads Ford sells plugs for the back of the heads (#F4ZZ-6E086-A). There are two in a pack. For this article I will only describe removal of the steel line leading to the H-pipe as I capped the line to the heads myself. 9) Cap off the line leading to the back of the cylinder heads using a piece (about 1 1/2" long) of the original rubber hose. Insert a snug fitting bolt (3/4" by 1/2") or a battery terminal into the hose and tighten two hose clamps, one over the steel line and one around the bolt/ battery terminal. Refer to picture. 10) Remove the steel line to the H-pipe by raising the passenger side of the car to gain access to the line from underneath. 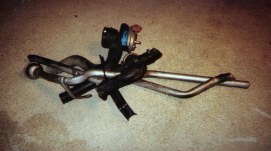 With a grinder or a cutting torch cut the line at the header/ H-pipe connection of the exhaust system. Make a second cut where the steel line joins with the H-pipe leaving 1" of the steel line protruding. 11) Sand the inside and outside of the 1" protrusion, rinse off, dry and apply a clod weld material inside the hole. Use items such as J.B. Weld, Locktite Cold Weld, or Quicksilver. Mix up enough that you can shove it 3/8" down inside the tube and bring it over top and down the outside or the tube about 3/8" as well. 12) Let the weld compound set up per instructions on the package. Your done.